When it comes to Holidaying at an Island, all that which comes into our mind is Crystal blue water, calm and serene atmosphere with natural and scenic beauty, sandy beaches, rich and colorful corals with greenery. Well, Havelock Island gives you exactly this. Havelock Island comes under the chain of islands to the east of Great Andaman in the Andaman Islands. It is one of the most beautiful and popular islands in the Indian Ocean. It is situated north-east of Port Blair, capital of Andaman and Nicobar Islands and spreaded over a massive area of 113.13 square kilometers. Havelock got its name from a British General, Sir Henry Havelock during the times when India was colonized. The government has permitted and encouraged the growth of tourism and has focused on the promotion of eco-tourism. The lighthouse situated at the northern part of the island near Govinda Nagar is a major attraction for tourists. It is quite famous for its beautiful beaches. 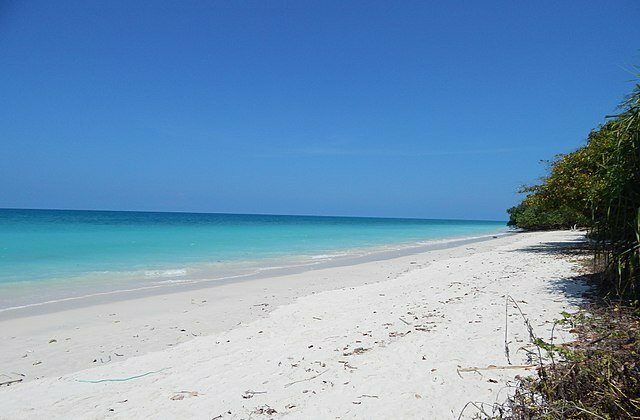 The Radhanagar Beach at the West coast which is popularly known as Number 7 Beach is the most popular beach on Havelock Island which was also named the “Best Beach in Asia” by Times in 2004. Apart from it, The Elephant Beach and Vijay Nagar Beach which lies on the Northwest coast and Eastern coast respectively are also beautiful and notable. Beach No. 3 and Beach No. 1 are other two famous beaches on the Eastern side of the Havelock Island. The Elephant Beach and Kalapather Beach are two of the beaches where the sunset and sunrise is a sight to behold. It is naturally bejeweled with white sandy beaches, mesmerizing Rich coral reefs, and green forests. The rainfed tropical forests create a green canopy to welcome everybody to its beautiful nature to have one of the best time of their lives. You are free to enjoy the underwater marine life and spend a quiet time along with rare corals by snorkeling or having one of the best experience by scuba diving at Carbyn’s Cove, Jolly Buoy, North Bay, Chidiyatapu, Havelock and many more. And if you are afraid of Diving, don’t you worry, There’s always the glass-bottomed boats to provide a similar marine life experience without having to dive in. It will be a beautiful experience both ways. And if you are more of a trekker, being engaged in a Jungle Trek and Camping will be the best for you. You will be having a great time in the lush green forests of Havelock. But many people like to stay away from these sports and rather like to have a quiet time. Well having a walk in the white sandy beaches with arms around your loved ones listening to the waves as it crashes on the shore has its own magic and beyond any description. Speaking of a loved one, it is also a great place to plan your Honeymoon. A walk into the simple fishing villages and the evening sunsets will just be perfect to bring your loved one close to you. Some of you can also try Game fishing which is a famous activity in Havelock. Even if you are not going for a fishing trip, these boats can be hired for sightseeing around the island. And you need not to be worried about finding a good place to stay ora nice meal. There are various resorts to give you the hospitality you require and there’s nothing better than a just-caught seafood. But even if you’re tired or all worked up, refuel yourself with fresh coconut milk. The best time to visit Havelock Island is between Mid-January till Mid- May as it has the best weather during this time. The days are sunny with moderate waves and calm sea. However, the monsoon season which hits Havelock Island around late May is not the perfect time to visit Havelock Island. It is also advisable if you take plenty of cash along with you from Port Blair as Havelock Island has only two ATMs (SBI and AXIS). And it is quite difficult to buy certain things such as Sun cream and mosquito repellent. A word of caution, i.e. the internet connection on Havelock Island is extremely slow and it is also not reliable. It is also a bit expensive. However, you can get a satellite internet at some dive resorts but the rate per hour is extremely high. However, stay safe and do not venture out in the ocean in search of adventure. It can be risky. But all over Havelock Island is a fun place. It is indeed a beautiful secret.